Police in India have arrested Yasin Bhatkal, the alleged head of the Indian Mujahideen (IM) militant group, which has been blamed for a string of recent attacks, officials say. The group is thought to be behind deadly blasts in the cities of Pune, Bangalore, Hyderabad, Mumbai and Delhi. Mr Bhatkal, who officials say is a co-founder of the home-grown group, is one of the most wanted men in the country. Reports say that he was detained close to the border with Nepal. The arrest of Yasin Bhatkal is being described as a "second major breakthrough" by security analysts. Less than a fortnight ago, Delhi police said they had arrested Abdul Karim Tunda, believed to be a bomb expert from Pakistan-based militant group Lashkar-e-Taiba. Both were arrested along the Nepal border, although it's not known if the arrests are linked. Police suspect Yasin Bhatkal is behind multiple attacks in which hundreds of people have been killed in the last five years. The 30-year-old engineering graduate from the southern state of Karnataka keeps a low profile. But he is believed to be a "hands-on" militant - intelligence officials say he actually planted the bomb in 2010 in Pune's German Bakery. He was apparently captured on CCTV there, and again at a blast site this year in Hyderabad. "Yasin Bhatkal was arrested last [Wednesday] night in [the northern state of] Bihar," Home Minister Sushil Kumar Shinde told reporters on Thursday morning. 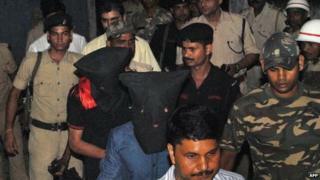 He is in the custody of Bihar police and is being questioned, Mr Shinde said. Reports say the 30-year-old is being brought to Delhi. His real name is believed to be Muhammad Ahmed Zarrar Siddibappa, but he uses a number of aliases, officials say. The authorities had announced a reward of 1m rupees ($14,862; £9,583) for information leading to his arrest. Mr Bhatkal was arrested along with another alleged member of the IM who has been identified as Asadullah Akhtar, reports said. The group was outlawed in 2010 after Indian authorities blamed it for an attack on a German bakery in Pune in which 17 people were killed and 64 people were injured. The IM is also blamed for three co-ordinated blasts in July 2011 in Mumbai in which 27 people were killed. Media captionHome Minister Sushil Kumar Shinde: "The interrogation is going on"
Mr Bhatkal's father said he believed his son was "innocent" and he was relieved that he had been arrested. "The truth will come out and our fears that he would be eliminated in a fake encounter have been put to rest," Zarar Siddibappa said in a statement. "We have complete faith in the judicial process. He should be punished if he is guilty of any offence after the due process of law is followed. "The cardinal principle that every person is innocent until proved guilty should be followed," he said. The arrest is being described as a major success by security analysts in India. "Yasin Bhatkal being caught is a big achievement because he was a big motivator, logistics provider. He had learned to make explosives and he had also trained many others in making explosives successfully," Reuters news agency quoted defence expert Bharat Verma as saying. Former home secretary RK Singh told the NDTV news channel that security forces had been working for years to catch Yasin Bhatkal, whom he described as "one of the most active terrorists in the region". "Catching a trained terrorist is very difficult and, therefore, I feel it is a great success," he said. However, Ajit Kumar Singh of the Institute of Conflict Management in Delhi urged caution, saying the arrest would be a "big catch" but the police had a history of bungled operations, AFP news agency reports. "The intelligence agencies deserve a huge pat on their backs if they have indeed arrested the right man," he said. Police in Londonderry say they are getting unprecedented support as they investigate the journalist's death.